Published on March 22, 2011 by cara.b.b. when we moved in this house, i knew that one of the first things we would do is paint the oak woodwork. i’m sure i’ll come back around and wonder why oh why we painted all of our woodwork, but that’s not today. don’t get me wrong, i like oak in the right place, but it wasn’t on our built-ins. it made such a difference in our family room. what was once dark and a bit cavernous is now light and bright. 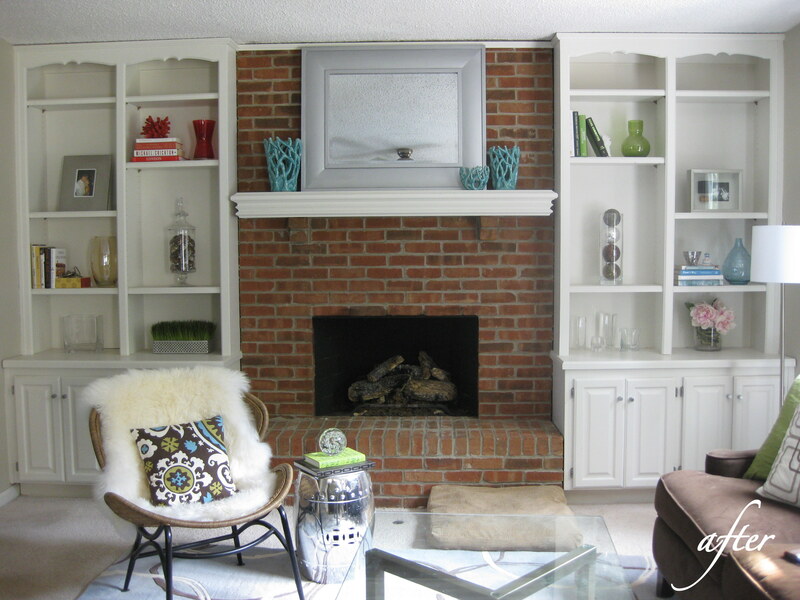 i love how painting the woodwork white brought so much attention to the brick fireplace. julie over at milk & honey was kind enough to feature our mantle on her blog a while back. thanks julie! on a side note, we’re preparing for a road trip to denver on thursday, and i’ve turned our guest room into a staging center for all our stuff – it’s a sight to see, people. have you packed for a baby before?? oh my! if anyone has any hot tips on traveling in a CAR for NINE HOURS with a SEVEN month old, pipe up!! i’m equal parts excited and terrorized for the drive. 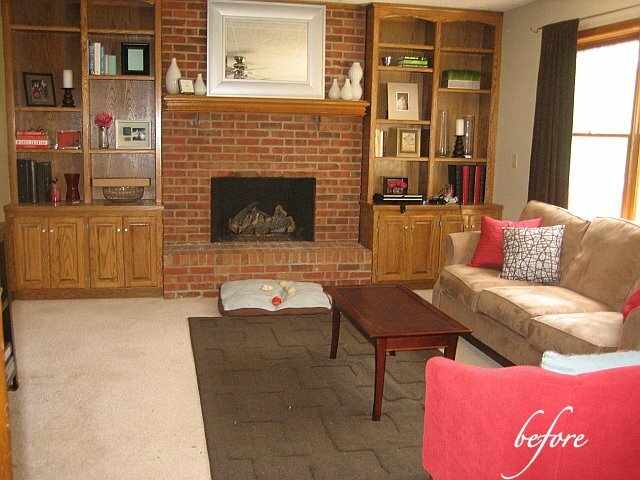 OMG – Your oak bookcases and brick fireplace look just like mine! I have been dying to paint the oak white – but am nervous that I’ll be painting and painting forever to cover over the dark oak. Would you please share how you did it? hi najla! we actually hired someone to paint in our family room, but i have since done a lot of cabinet and trim painting myself. first, do a light sanding and then clean your surface. i use a good primer like kilz or zissner, and then slap on whatever paint you like. you may need to do a little light sanding in between coats to make sure you get a really smooth surface. some people swear by oil-based paints, but i hate the clean-up. i just use latex, and usually a semi-gloss for trim and cabinets. hope that helps! Thank you! You helped a lot. I will definitely try what you suggested. I really appreciate your quick response. I enjoy reading your blog!